Follow the tutorial below to make this basket! Recycled magazine baskets are fun, charming and just right for catching small items like napkins, keys or craft supplies. Make as many as you have magazines. While traditional baskets are woven out of reeds or strips of wood and bark, the same techniques can be used to weave recycled paper. While the finished size of the basket is dictated by the size of the paper, you can have lots of fun with color by pairing up magazine pages in similar shades and patterns. 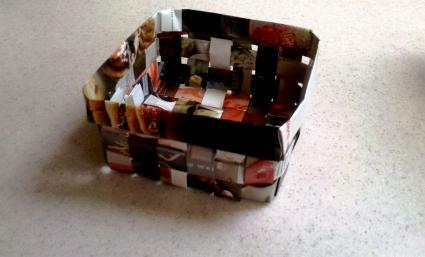 Try repurposing some of your old magazines into fun and useful baskets. Cut the magazine pages lengthwise into 2.5 inch strips. Place a strip in front of you horizontally and fold the top edge towards you, so the cut edge touches the center of the strip. Fold the other cut edge up to meet the first, so both cut edges come together in the center of the strip. Fold the strip in half so the cut edges are in the center. Use a Glue Dot to secure the strip and keep it from unfolding. Lay five strips side by side on the table in front of you. Pick up a loose strip and weave it under and over the strips on the table. Repeat with four more strips. Push the strips close together to form a tight weave and use Glue Dots on the corners and end strips to help hold them in place. Bend the ends of the outer strips up at a 90 degree angle. Begin weaving loose strips through the outer strips to form the sides of the basket. Secure with Glue Dots. Trim the tops of the strips down when you reach the top with weaving so the top of the basket is level. Fold over the remaining strips on the top of the basket to form a finished edge. Secure with Glue Dots. 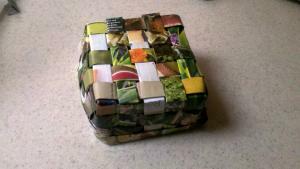 The finished basket is roughly 4.5 inches square and sturdy enough to hold small objects. 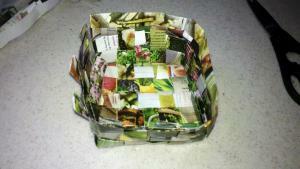 Lidded basket: This photo-tutorial at Flickr explains how to make a recycled magazine basket with a lid. 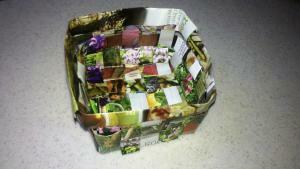 Nesting baskets: This tutorial from the Craft1Up blog gives a step by step guide explaining how to make a basket out of recycled magazines. Basket with a handle: This tutorial shows you how to weave a basket with a handle out of paper - just follow the folding tutorial above to use magazine pages. Use brightly colored shiny magazines to make striking looking baskets. If you use black and white newsprint, try spray painting the inside or the outside of the basket to make a dramatic contrast. Use a clear varnish to add further protection to the basket. A mat or silk varnish will give a sleek contemporary finish. 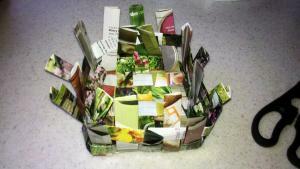 Vary the size of the basket by using different widths of paper. Very small baskets would make unusual gift boxes. Recycled magazine baskets are easy to make at home and are a great way to recycle magazines as well as make stunning items of artwork. 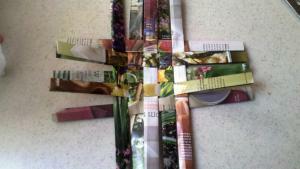 Start weaving some of your own and keep your magazines out of the landfills.